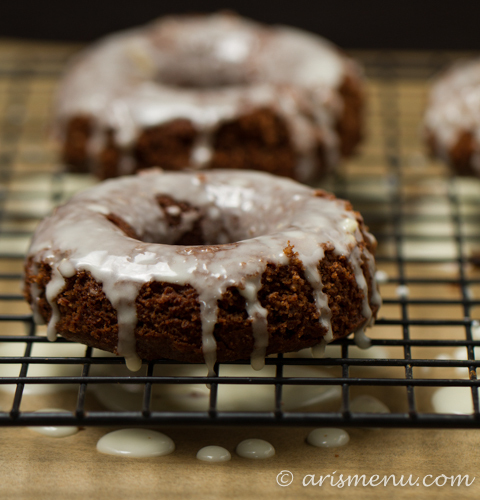 Rich, fluffy, chocolatey donuts topped with a smooth, bright, citrusy orange glaze. The perfect flavor combination. Have I ever told you about how my husband refuses to use the correct name for the cooling rack? He insists on calling it the “drying rack”, and whenever I ask him to get out the cooling rack, he corrects me. And every time I make sure I let him know that he’s wrong. The drying rack is for dirty dishes; the cooling rack is for delicious baked goods. At this point he (obviously) knows the difference, but I’m pretty sure finding ways to annoy me is his favorite past time. In fact, I’m pretty sure everyone who knows me gets a deep sense of joy out of getting a rise out of me. Probably because I make it so easy. I am the first one to get all fired up about things that absolutely don’t matter. I think they call that “dramatic”. So, this morning I made donuts. I never make things the day I post them, but this is what happens when I sign up for things. I forget all about them until, like, the day before, and then I’m like “Oh crap, I have to make donuts”. Anyway, I made donuts, argued my husband about the term for the rack where I placed the donuts, ate the donuts (totally the best part), and, well, here I am. Sharing donuts with you. The bright orange flavor of the glaze is the perfect contrast to the rich chocolate, and the recipe all comes together in about half an hour, so it’s easy to make at the last minute if you have guests, and want to give them a little treat. We had my family over for brunch this morning, and everyone was super impressed with these! My mom kept talking about how “professional” they were. Then my brother proceeded to eat 3. I don’t blame him. Preheat oven to 325. Spray donut pan with nonstick spray. Set aside. Place dark chocolate and coconut oil in a small microwave-safe bowl. Microwave on increments of 30 seconds stirring after each until melted. Let cool while preparing other ingredients. In a medium bowl, combine baking blend, baking soda, cornstarch and salt. In a large bowl, beat together brown sugar, egg, buttermilk, applesauce and vanilla. Slowly beat in melted chocolate, then beat in dry ingredients until just combined. Fill donut molds about 3/4 and smooth out with a spoon. Bake for 11-13 minutes until set and donut springs back when gently pressed with your finger. Place donut pan on a wire rack and cool completely. Once cooled, remove from pan. To make the glaze, place powdered sugar in a medium bowl. Slowly add orange juice 1 tbsp at a time stirring constantly until glaze reaches desired consistency. I went with a thinner glaze for this donut. Thickness will depend on liquid added. It is important to go slowly and mix thoroughly before adding more liquid. 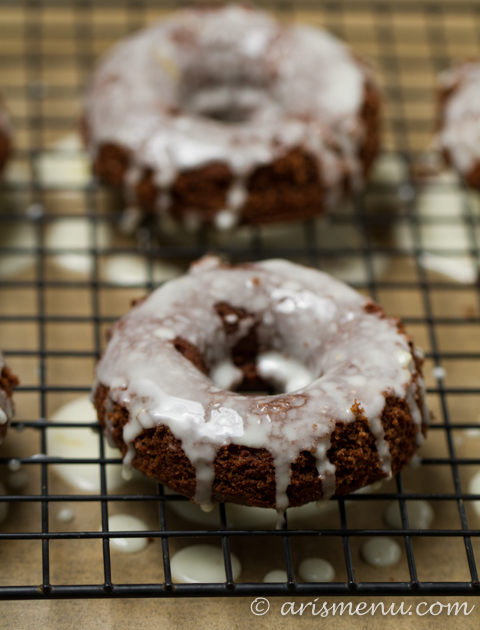 If you find you glaze is too thin, add more powdered sugar until it reaches your desired consistency. 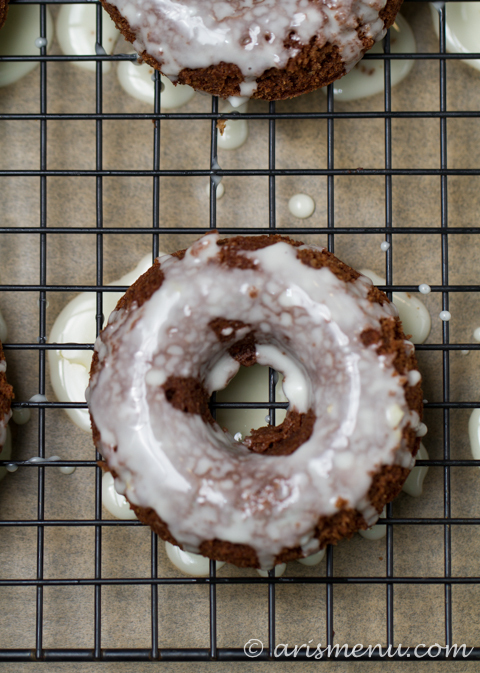 Drizzle glaze onto donuts and let set until dry, about 10 minutes. Store in an airtight container for up to 5 days. Donuts will stay fresh best if you store them unglazed and glaze before serving. How cool to have a healthy alternative to chocolate donuts. I really love chocolate donuts, but avoid them ue to the fact that they are so unhealthy. These look like the perfect solution for when I fell tempted by them. These look soooo good. Lucky family! Good thing I’m heading to the grocery store soon. I need to restock my powdered sugar supply to make these ASAP! Yum! I’ve not had a donut in ages. I’ve never been one for donuts although I would love a donut shaped baking pan. Haha that’s funny about the drying vs. cooling rack!! These look really good! 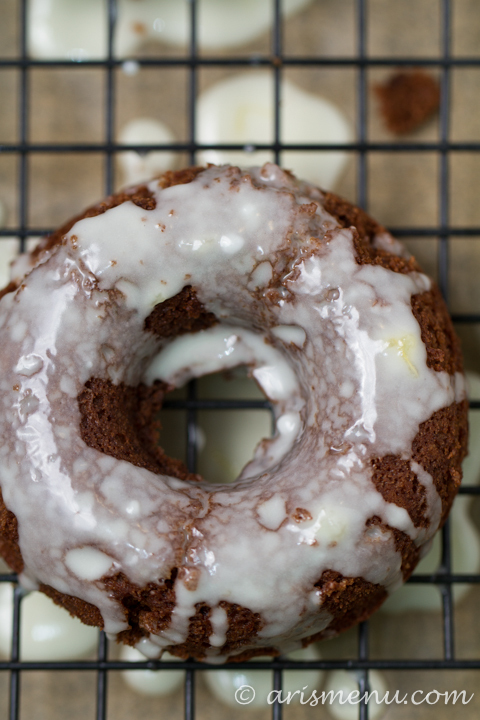 I was going to do a baked chocolate donut recipe I use alot for christmas brunch, but think I’ll try this GF option since we do have one GF person in the group. Thx! I call it the “wire rack” and it solves all problems. 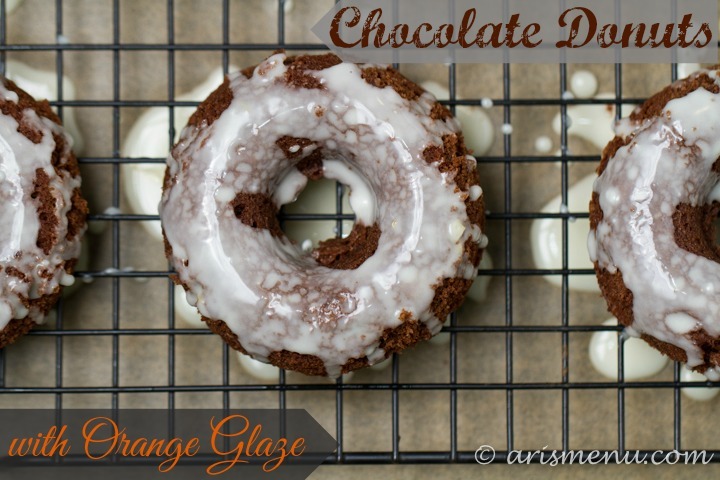 🙂 These look really delicious and I love the orange glaze, a nice twist on chocolate donuts! Blackeyed PEAS!! Those are my good luck foods – eat a spoonful on New Years day! PS. Want these donuts now!